My flutey life in print! Eeek! But I have to show you the cover too! The cover term: Digitally Ubiquitous, ha hahahahaa! You can click on the pictures to enlarge them. Just use the backbutton to return here. And where did this Cluffy profile come from? Well, my good pen-pal-friend and fellow flutist, Jerry Pritchard published a profile on "moi" for The Flutist Quarterly Magazine. What a lovely article and what a lovely writer. Thanks so much Jerry! If any flutey reader has any follow-up questions, fire away! Yes, I do live on less than $5000 a year. Yes, I do indeed practice along with recordings of great symphonic literature, by changing the sound files to A-440. Yes, I do have strange things glued on my flute. 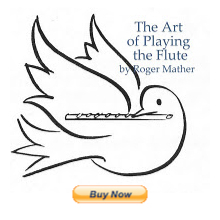 (a la Moyse's and Baxtresser's flutes). And yes, we do commute by small boat to get home each evening. Yes, yes, yes it is crazily alternative, but hey.... This is your life! ha ha! The profile is in the Fall 2010 issue. I'm hugely grateful that this particular issue is so full of brilliant articles. It's a real KEEPER!!! Huge thanks to the writers, editors, and hardworking staff at Flutist Quarterly. Made my year to be included in an issue like this! So amazingly high quality! WOW! I always wondered about your background and how you came to be on the internet: before I could afford lessons, I sought out your website in order to educate myself: now that the lessons have started, I go to yur page to get tips and remind myself of good habbits I have been letting go of. It has been really wonderful to have all of this information available and I thank you so much! Benefits of membership are enjoyed by all NFA members whether living inside or outside the United States. However, because of the high cost and special handling requirements of mailing outside of the United States, international members are required to pay the additional postage fee below. Note, however that e-members are not subject to these additional fees. Congratulations on a wonderful interview--and thank you for sharing the information on Flutist Quarterly! Congratulations Jen! This is quite an honor. I actually always save my Flutist Quarterly. Less than $5,000 a year? That is truly amazing. All the best for the new year! Thanks. I have had the proclivity to live without much money all my life. When I was a little kid, I used to save up my $1 a week allowance to buy one pair of really good wool socks. I guess I thought I lived in a century of thriftiness; my mother still laughs about it. On your own you'd probably be homeless on that budget. Yes, you guessed right; someone owns the house, and I pay a very small rent. If I had to pay full rent, I'd have to go out to work twice as much. I earn less than EI or Welfare, that's for sure. Good thing I make my own clothes, cook from scratch and have hobbies that cost literally pennies. I also use the library a lot.